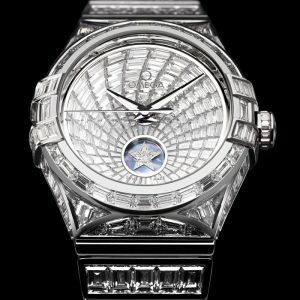 Thursday 07 January 2010 – Every constellation in the universe has its brightest stars, and in OMEGA’s newly-redesigned Constellation line, nothing glitters more brilliantly than the unique and luxurious Constellation Baguette. 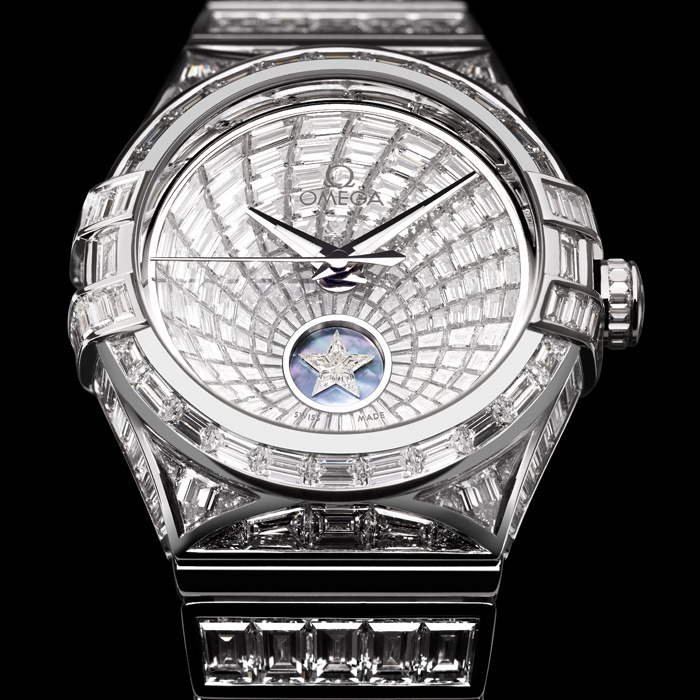 The Constellation Baguette has been created with a strong and vivid visual identity – its dial displays a dramatic supernova structure which emanates boldly from the diamond Constellation star on its mother-of-pearl background at 6 o’clock. 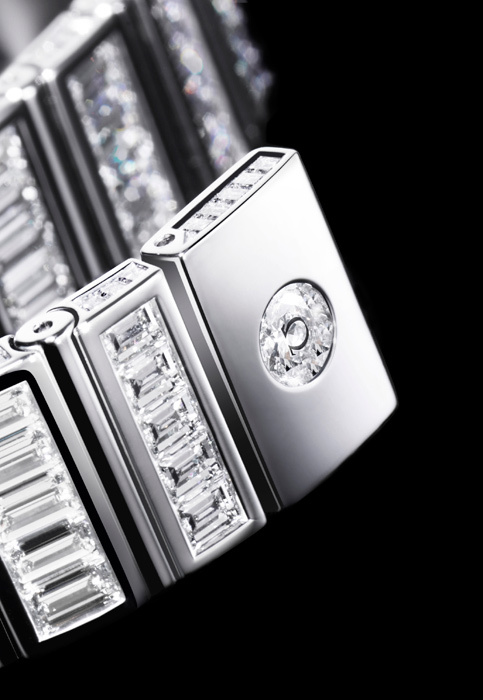 The one-of-a-kind masterpiece glistens with 459 Top Wesselton diamonds totaling just over 30 carats. The “invisible” mounting of the 146 baguette and trapeze diamonds on the dial means that no trace of the 18 Ct white gold used in the creation of its case can be seen between the precious stones. The Constellation Baguette is not only an aesthetic wonder: it is driven by the OMEGA Co-Axial calibre 8421. OMEGA’s Co-Axial technology, introduced in 1999, has revolutionized the way fine mechanical watches are made. The movement’s Co-Axial escapement reduces the amount of sliding friction in the watch, virtually eliminating the need for lubrication, which means longer service intervals and greater precision over time. The Si 14 silicon balance spring adds resistance to shock and the effects of external disturbances. Because the OMEGA Constellation Baguette is a one-of-a-kind horological masterpiece, every one of its 459 diamonds has been cut specifically for the watch. As a result, if one of the stones needs to be replaced or exchanged, the process can take longer than it would for a series-production watch. Any new diamond will have to be custom-prepared so that it matches the colour, clarity, cut and carat size of the stones around it. In fact, due to the absolutely unique nature of the Constellation Baguette, no standard replacement parts can be kept in stock – each one would have to be specially created for this extraordinary timepiece. The OMEGA Constellation Baguette is the most elegant Constellation ever created and expresses the ultimate blend of elegant design and superior watchmaking.